Q: So Brenden, you brought back ‘old school’ with the whole Socks Up Tuesday, huh? Now, Bryan Pruitt told me that he left his socks down just because he was little bit of a rebel. (laughs) Do you remember that? Q: And Bryan ended up volunteering to do kickoffs, too? Q: Where did the Pipeline-thing start? Do you know? BS: I do. You know the thing about it was that we once again -collectively- all of us sat around and every day we’d talk about stuff, and what we really wanted to do was really put a label on what we were doing up front, across the board for all the offensive linemen. And we were getting so much attention up front because we were putting up some great numbers. And once again, it just kind of fell down to me and someone said, “What do we do?” And actually, Rob and I used to talk about this all the time when we were younger, because we’d always get in that back room in the weight room and kind of work on our ‘guns.’ Remember that back room, with the mirrors? We’d sit around going, “Hey, wouldn’t it be cool if we had this huge poster, and it would say, ‘Pipeline,’ and it would have our guns, our pipes?” It was so weird how everything came to fruition, everything we talked about, from the pancakes to the pipeline. And you know “The Pipeline” really took effect when Colorado got off the plane with pipe-cutters. And we knew exactly what that meant, because they were going to bust the pipe in half, right? Yeah, sure, they came in here and we whooped up on ’em. It was great. BS: Just the arms, you know? ‘The pipes’. One day we just said it would be cool if we were known as the ‘Pipeline’, and boom, there it is. They had a poster with us on it and there was culverts, they got us around a bunch of culvert pipes for the picture, and I’m not sure if they ran away with the Pipeline thing, it think that was just us. And after the season we had some shirts made. Aaron Graham couldn’t do it because he was still eligible to play, NCAA-wise, so he couldn’t do it, but Zach, Rob, Joel and I made sure it said on the front, ‘The Pipeline’ and ‘When it’s on the line’ on the back. I still have a couple of those shirts that haven’t been taken out of the wrapper. And what was great was that it got into Sports Illustrated. And I remember talking to reporters back then, it was, “What’s that all about?” I said, ‘You know, it’s more about putting the offensive linemen on the map. You always hear about the running backs and skill position guys, and linebackers, making plays all the time, getting their face in front of the camera. And the only time you heard about offensive linemen was when it was a penalty.’ I said, ‘It really puts us on the map,’ and it really did. What happened was, it shone a little more light on what really makes an offensive team work. If you don’t have the unity, the cohesiveness, the attitude and the ability, controlled aggression and smart guys up front that were athletic, you’re gonna be a subpar team unless you had all those ingredients, and it starts up front. And the defensive side of the ball, unless you have those defensive linemen slowing those guys coming off the ball for those guys on the second level, what kind of defensive line are they, really? And at least those guys get the stats and notoriety for getting sacks and all that attention, but for linemen on the offense, the only thing you can do is get a pancake. And really, who monitors that, you know? So we monitored pancakes: how many times can we get guys on their backs. 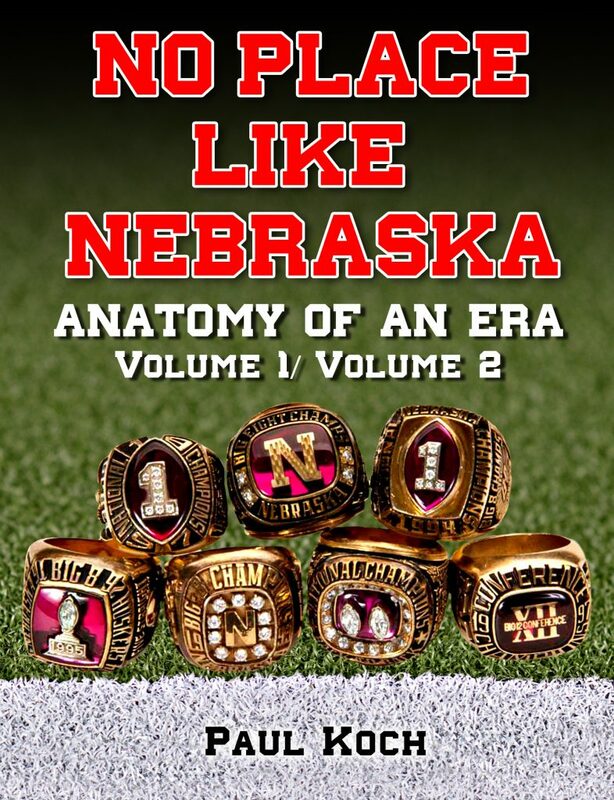 We started that, and when I talk about that Sports Illustrated article it was about putting offensive linemen, period, on the map, and especially the offensive linemen at Nebraska. Q: You talk about controlled aggression…where did that come from? Coach Tenopir, Young? Yourselves? BS: I think the attitude came from us collectively as offensive linemen. We just decided that we were going to be just dominators. It started off with Mike VanCleave, who was a tremendous artist, and he said, “Brenden, can you see something that has the word ‘Dominate’ and have a picture of two offensive linemen just bending guys over backwards, and their pipes just flaring up, the left and the right?” I still have that picture he drew, and if you a want a copy of that I can get a copy for you. And I went up to Coach Tenopir and I said, ‘Listen, you’ve gotta take a look at this picture.’ It literally took him no more than 5 seconds to go, ”It’s going up on the wall!” And he had somebody superimpose that on the wall of the offensive line meeting room. And when Callahan came into power they took it down. Q: Pretty cool stuff. You talked about unity. What I’m understanding is that the coaches obviously did their jobs, but you guys were very proactive and took charge of a lot of stuff yourselves. But with the captains that we had and everybody collaborating on what should happen, that just created that Unity Council, which was put in place to create an atmosphere of family, and at the same time, hold anybody accountable for any action that had to be addressed. And what happened, it really stemmed from all the players coming together and figuring out what was keeping us together, but at the same time acted as a deterrent for guys going out and doing their own thing. BS: Absolutely. A lot of that happened in the PR Department, but I think a lot of it had to deal with Jack Stark, the psychologist. Jack, he had a lot to do with helping the guys formulate some sort of -from a psychological aspect- formulating some of the stuff. I wasn’t on the board for the Unity Council, those were the Captains. It was always Rob, Zach, Ed Stewart, Terry Connealy, Trev Alberts, those were the guys that really headed it up, and there was an agenda there and everybody had to vote on it. “Refuse to Lose”, “Unfinished Business”, the guys absolutely bought into that. With those words, I should go back and restate, the “Unfinished Business” obviously came from that loss to Florida State, but it was something that was ingrained in us after that game. It was, “Man, if we had just two more plays! One more play! You know, we’d have won that game.” We didn’t leave it all out on the field there, and we had some unfinished business to do. A lot of it had to do with Coach Osborne’s talk after that game and the next summer the 1:16 up on the scoreboard. There was a definite focus there for everybody, and we got right back to where we wanted to be and we finished it. Q: Do you recall Coach Osborne’s talk after that Florida State game? BS: It’s hard to. With those kind of losses you’re just kind of …it was hard. I think back and try to wrestle away a lot of what coaches say after a game, losses and wins. For example, I listened to Coach Bill Cowher give a speech after the AFC Championship in Pittsburgh and I totally forgot how emotional it was for him, being a young coach and getting to that point where he promised he would take that team. And I totally forgot how Greg Lloyd got up there and started talking about the defense and dropped an F-bomb -it got on TV- so they went right back to the studio and Joe Montana. He mentioned the offensive line, and he mentions my name… but I totally forgot about those talks for whatever reason. I just remember the overall feeling of being so close but still so far away, just having so much to do, you know? But very inspiring. And one thing I do remember at halftime of that ’95 championship game where Coach Osborne’s speech talks about a few things that are gonna happen here, from here on out, that are gonna decide this game, “We’re gonna make a big play. They’re gonna make a mistake and we’re gonna get a huge turnover.” It was amazing how those things, the penalty that happened, there was the turnover which I call the safety, of course the huge play at the end of that game, scoring with Cory and wearing them down. That’s one thing he said, “We were gonna wear them down”, and of course, all those things happened. It was great. It was almost like he was a prophet up there, he just kind of laid it out and it happened. Q: Recalling that Miami game, you and Joel Wilks did the switch, right? Can you give me some insight as to what was going on in your mind? So we started talking about some plays, you know that quick draw that we ran a couple of times. And if you look at that last touchdown, on that play there was really only two people that blocked anybody, it was me and Aaron Graham. (laughs) If you look at right tackle, Zach Weigert comes down and totally misses his cut when Joel pulls to the left to trap Warren… and Warren’s like 10 yards up the field, so he doesn’t have to touch him. Then you’ve got me: the whole play was, I head-bob Warren and get him to go up the field, and then go straight after the middle linebacker -I think Ray Lewis- on that play. Rob came across and just basically got in the way, it seemed. Basically what happens is the left guard and left tackle would ultimately meet at the linebacker position, but Rob didn’t meet anybody, and the next guy over was Matt Shaw, who -really, if you think about Matt, he cut off somebody, which was critical, cut off the legs to penetrate that inside gap there- and then Abdul Muhammad on the outside, he had the best part of what created that touchdown because he sprinted and got in front of this guy and didn’t block him, just kind of cut him off, and then Cory scored. So really, when you look at that play, it was kind of designed to utilize our ability to have Cory run the ball on a quick trap/draw play and utilize their strengths against them and it’s exactly what we did, scored twice on it. It was definitely a challenge for me. And the funny thing about it, Joel, when he heard about it, he was pumped up. He was like, “Yes.” Once it went public, in the media, it became a war of words with Warren and I. I told him I was going to wear him out and he said he was going to “rip out my larynx” and this and that. You look back at those newspaper articles, it was funnier than heck, and the attention was there. And it was such a smart game plan by Coach Osborne. And Warren? The guy was good. He was probably one of the best defensive tackles to come out of college, maybe besides Cortez Kennedy or a Bryant Young. Those guys are so quick and fast and strong. And of course, Warren had all that together, and I played against him every year in the pros. And every year he gradually got heavier and heavier and heavier and less and less effective, but those early years he was just dominant. So it was fun, because once we got back into the swing of things I’d graduated. It was my graduation ceremony and it was right before we left for down to Miami. And right after graduation I was just overwhelmed all day long, you know: just graduated from college and my Mom is here; it was very, very emotional for me. So we get to practice, and I think I screwed up about 10 plays at the left guard position and all the coaches were like, “What the heck is going on? !” And I think after maybe a couple of plays, but it seemed like ten plays, and Coach Osborne was like, ”Maybe we should have let you have the whole day off, Brenden.” (laughs) But from that point on I was very focused and went into that game just completely determined to get after Warren and their whole defense and wear them down. And looking back on that game and the first play, you know, it’s an interesting insight when you talk about offensive linemen; your first series -you more or less see them on film, you mentally prepared yourself for all the plays that you’ve got, all the defensive looks you could possibly have- but now it’s time once you get in that game, you understand the speed of it and you’ve got to try to convert yourself and conform yourself around the situation. And it takes some getting used to, a couple of plays. And Warren Sapp was one of the better pass rushers, and for an offensive linemen in the NCAA there’s a lot on my plate there -not that I lost sleep or anything- but I knew I had to be very focused on my technique. That first play we come out I took a little three-step drop and what I was gonna do was sit on Warren a little wider: one of those moves he did was a rip and a slap at the same time, and I was expecting him to come back inside. So Aaron, our center -no one was helping on that, because Aaron was sliding to the right- it was just Rob and I sliding out taking care of man versus man on the left and so I had to really protect that inside. Well, he did exactly the opposite. The first thing he’s gonna do it root-hog and bull-rush me, and not a lot of guys could do that to me. He bull rushes me, pushes me back about 3 or 4 yards. So the plays over, it’s a three-step drop, and we completed it. And I go back to the huddle and look at Aaron and he goes, “Gee-eez!” I said, ‘Did you just see that?’ Warren got up underneath me, and he was so fast and so quick into me and I was like, ‘Holy crap!,’ and Aaron looked at me and goes, ”Oh, my God!” and I go, ‘How’d you see that?’ And he goes, ”Well, they didn’t need any help, and I looked over at where you were getting drilled back.“ And I said, ‘That’s the last time that’s gonna happen, too.’ And it sure was. Warren made some plays that game. That play, we designed strictly for him. We had to kind of adjust a little bit, because the timing wasn’t right for our one back position. The fullback position was great because it was a quick, little trap, but if we ran that draw with Warren, I remember one time he was so quick up the field he was around me before whoever the running back was -maybe it was a shuffle pass- but I remember it being a little draw or something inside, and he got all the way around that super-quick. So when we got to the sideline it was, “Hey, we cannot delay or stall any sort of action in the backfield with this, guys. I am set on the guy, and if he goes inside I’m drilling him inside. And if he goes outside I wanna get him out and go try to run and get somebody else.’ And he was around me so fast, the ball hadn’t even gotten handed off or shuffled forward. BS: That was the one. That’s where he went over by the sideline in front of Coach Osborne and all that stuff. After that it wasn’t a piece of cake, but I tell you what, we wore ’em out. And that doesn’t mean I wasn’t worn out. I remember going up to the room after we won and everybody was so excited down there at Bel Harbor and everybody was jumping up and down. And I remember some sound clips of the game -and Aaron Graham and I were roommates- it was after the game and we were laying there and my whole body is cramping up, I’m so exhausted. And my wife calling up -my girlfriend at the time- she was saying, “Where are you?! We’re down here in the lobby! Everybody wants to talk to you, everybody wants to see you!” And I’m like, ‘I’ll be down in fifteen minutes.’ So tired, you know? Not only was I physically tired, but emotionally. It was just a tremendous experience we’d been through, and to just climax at the very end there and win it all. There was no doubt in my mind if they were going to give it to us. Penn State was kind of on the bubble whether or not they would have a split title, they kind of struggled with the Oregon offense. Going in we were #1 and they were #2, and it’s something I’ll never forget. I can close my eyes and remember everything. Just the smell and the air of competition. It was just tremendous. BS: The smell. That, I remember, it was not only that humidity, but if you remember they had a circus, with elephants out there on the field. There was the smell of elephant poop out on the field, too. It was weird. Q: (laughs) Did you ever get the chance to talk to Warren Sapp about that game? BS: All the time. Well, I shouldn’t say ‘all’ the time. You know, when I was playing against him he’d always jab at me here and I’d jab at him there. Q: Hey, I don’t know if you’re aware of it, but you were paid a huge compliment by Warren Sapp a few months ago on Showtime’s NFL show. Did you hear about it? BS: No, what was it? BS: (laughs) He never beat me once. Well, actually there was one time we were playing Tampa Bay and the guy I was playing next to -it was a revolving door at that right tackle after my third year. It was just so frustrating- but a guy named Jamain Stephens was playing right tackle and he got beat, and it was on a pass play and I was blocking Warren and kind of flushed him out of the pocket… and the next thing I know, he keeps going. The play is about 5 seconds into it and I’m like, ‘Where are you going?’ And I turn around and our quarterback’s right there and he ends up fumbling. Our quarterback gives up the ball and then Warren jumps on the ball, gets the ball. And I’m right there, so it looks like I gave it up or something like that, you know? But I never gave it up. Never gave up a sack to Warren. Going up against a guy like that, that’s saying something, because he obviously was a great pass rusher, probably one of the quickest guys I’ve ever played in my life. He was the fastest thing I’d ever seen. And then you’ve got some guys like Rob Burnett, a lot of people don’t even know who he is, but he played for the Browns and then ended up transferring to the Ravens and won the Super Bowl. There’s a guy, I gave up two sacks to that guy in my career. I went against him 5 straight years and gave up two sacks. And you remember how quick and how fast they are. They can make you look foolish. Q: I’d love to speak to Warren Sapp. Any idea what he’d say about that national championship game? BS: I think he’d tell you at the end of the game they got worn out, but he’ll say they were the better team. He’s always going to defend his position, if I know Warren. I think he’s got a tremendous amount of respect for me, as well as the offensive line. They had Ray Lewis, Rohan Marley back there, Dwayne Johnson, Kennard Lang, all those guys had the #1 defense that year, and for us guys to go down there on their home field and take control in the fourth quarter when we were maybe getting our butts kicked, while never giving up, and wearing them out and having them on their knees while we’re ready to do our next play says a lot. I think he’ll speak to that. But you’ll never be able to get him to admit they got dominated.